To improve your chances for bumping take a look at AMEX Class Availability. This site allow you to search flights to determine how many tickets are available. If you are able to locate flights that have limited seating then your odds of being bumped, obviously, goes up. This site is fairly easy to use but may have information that is not accurate (ie. some flights or airlines may not provide data to the site). This site should be a tool in your bumping arsenal but not necessarily gospel. Example of flight with seats (2+2+2+1=7) available. Example of flight that is likely sold out. These two examples illustrate when a flight has seats (any set of non-repeating numbers between 1 and 9 next to the fare class letters) and is likely sold out (all 0s). If a flight has all 9s, 7s, or some other repeating set of numbers next to the fare class letters then the flight or airline likely did not disclose the flight’s ticket availability information. Use this free site as guide in your quest to be bumped. The information seems to be accurate for the flights I have searched but anything can happen so do not expect a bump opportunity every time you see all 0s pop up. As I have already stated, just use this software as a tool in you arsenal. 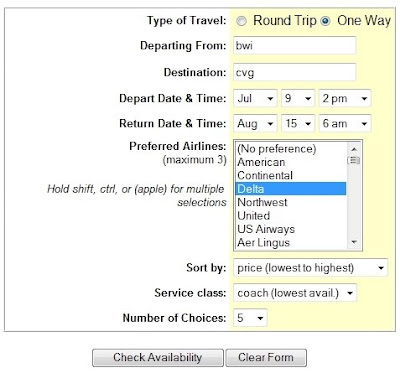 To further improve your bumping chances, I will be doing a review of ExpertFlyer, a fee-based site that also checks seats availability, soon to see if it is worth paying for this service. Hadn't heard of this tool before, interesting that its free. Expert flyer requires a fee, so if the availability is the same, I'd use this tool.